High Quality Content by WIKIPEDIA articles! High Quality Content by WIKIPEDIA articles! A tetromino, also called a tetramino or tetrimino, is a geometric shape composed of four squares, connected orthogonally. This, like dominoes and pentominoes, is a particular type of polyomino. The corresponding polycube, called a tetracube, is a geometric shape composed of four cubes connected orthogonally. A popular use of tetrominoes is in the video game Tetris. 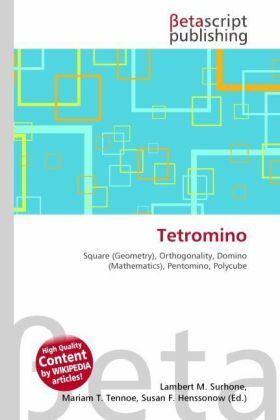 However, the word used by The Tetris Company differs slightly by replacing the first 'o' with an 'i' to make 'Tetrimino'.